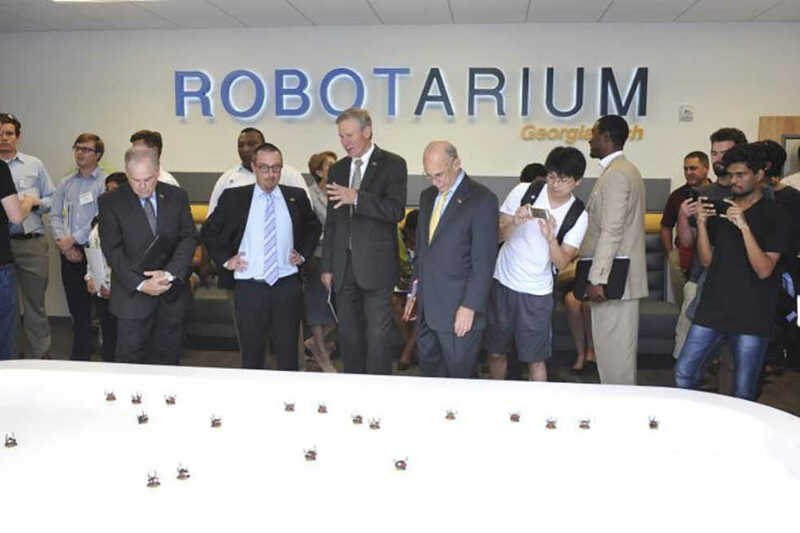 The Robotarium, a $2.5 million, 725-square-foot swarm robotics facility located on the second floor of Van Leer, held its ribbon cutting ceremony and open house this past Tuesday. Four years ago, in his Georgia Robotics and Intelligent System (GRITS) lab, Egerstedt began thinking about how to close the gap by opening access to high-quality swarm robotics resources to the world. When the group opened the tabletop Robotarium to researchers around the world, the responses were enthusiastic. “Since that, there’s been over a hundred research groups all over the world [using the Robotarium],” Egerstedt said. What made Egerstedt excited, though, is that in addition to roboticists, researchers from disciplines as diverse as biologists, traffic engineers and even sociologists have begun using the Robotarium for their studies. Through a $2.5 million grant from the National Science Foundation and Office of Naval Research, the tabletop prototype has been expanded into a full field, which is complete with rows of self-charging stations and the ability to fly several quadcopters at once. The interdisciplinary nature of swarm robotics was on showcase at the open house event on Tuesday. One experiment, uploaded by researchers from Arizona State University, simulated the social hierarchy of an ant colony choosing a new queen. In it, interactions between the bots affected each the social standing of each bot, whose LED light color was either boosted toward the green of a queen or the red of a reject. Eight infrared cameras pointing down on the Robotarium track each robot by identifying the four to six balls that are connected to each bot in unique arrangements. From this, orientation, position and velocity data can be found, and the robots can react to the state of the other robots around it. The Robotarium utilizes routines that drive the robots to self-charging stations to enable experiments to run all day and night without human intervention. Even with that efficiency, researchers who submit code currently wait about a week before receiving their experiment’s results due to the length of the queue. At any time of the day, passersby can peek at what the robots are currently doing through the large windows on the side of the Robotarium allows. “If you have a good idea and you want to do robotics, the first thing you do is not spend a million dollars building a swarm robotics lab. The first thing you do is you go to our website, upload the code and run experiments,” Egerstedt said. Egerstedt encourages anyone who is intrigued by the possibilities of robot swarms to just give it a shot.